This dugwell project is of new design adopted as per suggestion by the conveynor of Arsenic Task Force of West Bengal, Prof. S.P. Sinha Roy. 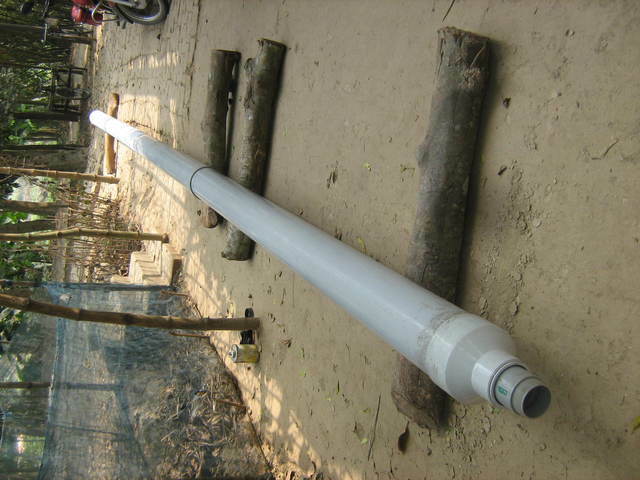 It is a bore well of depth 30 feet and the diameter of the bore/pipe is 8 inches with 8mm thickness that is attached to the hand pump. It is known that high level of arsenic is present in the second aquifer and below 50 feet. 30 feet below ground level is considered as unconfined aquifer that is generally recharged by recent rain water and not water that is underground, stored over a long period of time. 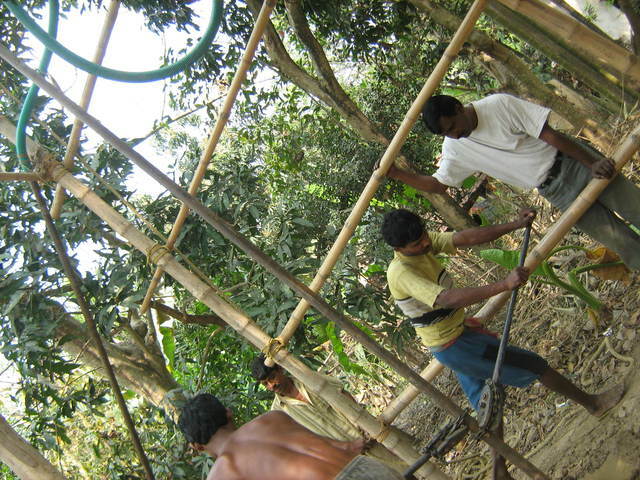 The diameter of the bore well is larger to cater more number of families. Hopefully in summer water will be available at the depth of 30 feet. Arsenic concentration was 5 ppb tested by the quick test field kit of usepa and Bacteria test is still pending. One of the randomly selected dugwell for the bimonthly test for arsenic. 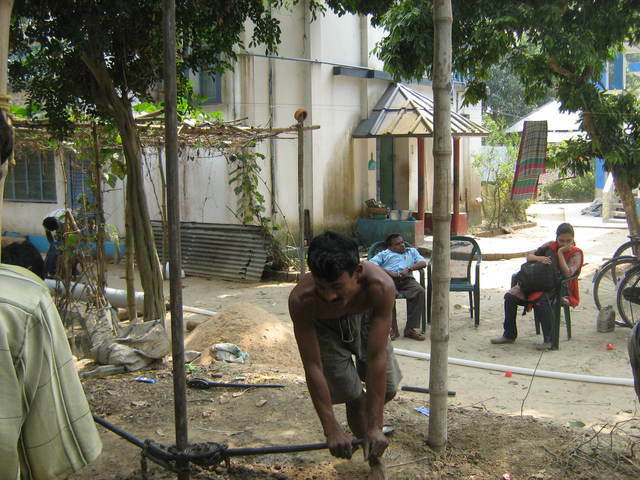 The water of this well is good and people are not using because arsenic level was found to be high. The arsenic is below the Indian permissible standard when water is passed through a folded material. The users are taking water from the contaminated borewell and have been informed that they should use the dugwell water that contains arsenic much less than the borewell and if passed through material is withing the permissible limit. Hope they will listen and follow the advice. The register record show 15 consumers from 4 families are using the water. 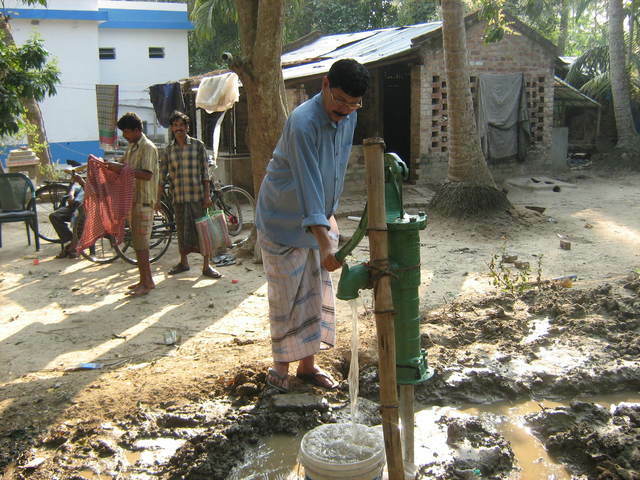 The community that is using this dugwell have been exposed to arsenic in their individual private tubewells of which one showed arsenic to be more than 200 ppb (using quick test kit of epa), one tubewell was about 100 ppb the water of which is passed through a supposedly arsenic removal household filter that lowered the arsenic concentration but was still above the permissible limit of 50ppb (BIS). So these people and their neighbors will take responsibility of repairing the minor l wear and tear of the borewell because they can afford it easily. 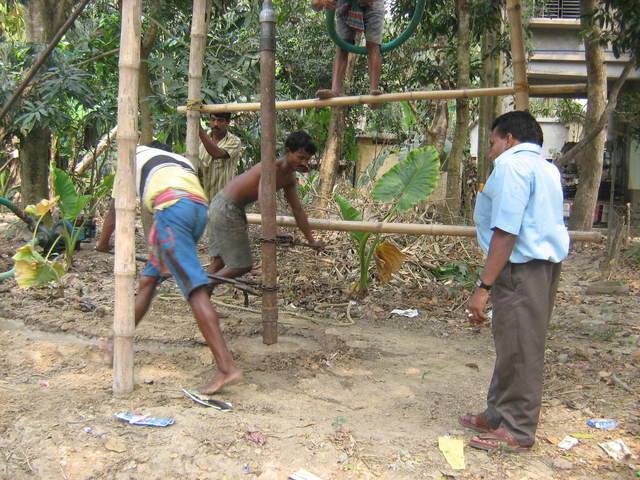 The water level of this dugwell will be closely observed for future installation of similar design. The cost of such dugwell will vary because of the dimension of the pipes that would be based on the location. According to register records from July 2011, there are 5 user families: Male= 9, Female=10 (child<5=1). Aqua Welfare Society, AWS, is the partner NGO of Project Well. Their office is based in the North 24 Parganas. The 7 honorary board members are located in Kolkata. Since the project is expanding new field workers have been hired on one year contract basis. The duties have been diversified. One person looks after the maintenance of all the dugwells (old and new), one person is hired to distribute theoline and train the new CBGs on application of the disinfectant. There are 3 other field workers who are interacting with the villagers and beneficiaries, training the users on maintenance of the dugwells, organizing village meetings and health meetings. The technical manager and his assistant are engaged in site selection and construction. The site selection is done with the help of the geologists. A technical advisor of AWS is based in Kolkata who visits the village occasionally and one awareness programmer who is in charge of awareness programs in the communities and educational institutions. There is an accountant and also a data entry person on part time basis. Recently a new management trainee has been appointed to oversee the program and send reports to Project Well.